File this one under the Keatsian department of "a thing of beauty is a joy forever." Much like these wondrous Russian computer cases, Hacoa is now soon-to-be-offering a do-it-yourself keyboard kit to the masses. The kit allows the purchaser to cut the keys from a plank of wood and assemble the pieces themselves; it's $300. Till now, Hacoa has typically crafted each keyboard by hand, churning out the sum total of one keyboard per day. But in an effort to lighten the company’s labor load, boost production, and probably increase profits, they are going to let the purchaser do some of the cutting and assembling at home. 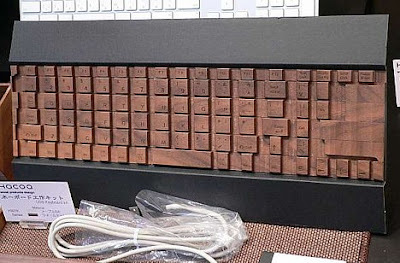 The kits come in maple or walnut, and include a USB keyboard base, a wooden plank with the beginnings of keys hard-carved into it, connectors for attaching the finished keys to the keyboard base, a saw, sandpaper and other tools.